Wry Thoughts About Religion: Who Am I? some of them may well be true. Epitaphs are for others to write, he thought. to conventional views of reality. Fantastic, as is the picture of the Wry Guy with his pet chicken. Compare to Tommy Smothers' complaint that his mother liked his brother best--because he (Tommy) was only allowed to have a chicken as a pet. Who a person is, is complicated. Tommy Smothers made a lucrative career out of his chicken (plus other odd talents), while I only have old Jack to remember. 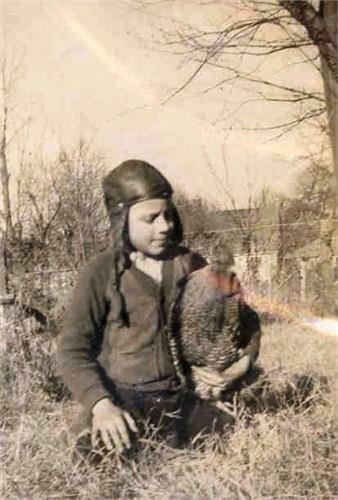 Jack was the mean rooster that my father had to spank on one occasion, because he attacked my mother. After that Jack always went to the far end of the chicken yard when people entered. Dad did not have to spank my brother Berry's chicken. We had him for dinner one Sunday--a bone (if I can put it that way)of contention between my brother and me for years after. But enough about chickens--let's talk about ideas. Who are YOU anyway? Nice touch on the chicken; his name is Jack. I love that poem. There is so much of you in those few lines! Charles, beautiful poem you've put together there, I think. That last stanza is mysterious. Who is the 'he' doing the thinking and writing therein? If you're going to ask who I am, I prefer to answer with the phrase, "a Christian." My biographical details are varied, but the most important thing I would say about myself would be to highlight my religious experience involving the forgiveness of sin, my personal sinful conduct and God's grace to me through Jesus Christ and the discovery of the beauty and profundity of Jesus' teachings. It is a humble honor to be a follower of Christ. I'm a little sheepish to admit I've cried many times looking at pictures of Jesus Christ and thinking of the reality of his presence among his disciples, past and present. Keep up the good work, Charles. Thanks for your observations. I did not set out to write a poem, but sometimes my muse has other ideas. I am not always in control, and frequently do not find out what I am writing until I finish. There are, I think, three voices in the poem. The first voice reports on what he has been told about himself, and allows how some of it may be true. A second voice, reading the mind of the first speaker, says what the first speaker is thinking (that epitaphs are for others to write) but does not say (of course the second voice may well be wrong in thinking that s/he knows what the first speaker is thinking). A third speaker takes up the challenge of the second speaker, and rather pompously “writes” the epitaph for the first speaker. The third speaker may also be wrong about the first speaker’s epitaph—a risk we all take when we pontificate on the essence of someone’s life, including our own lives. You are fortunate or unfortunate, depending on one’s point of view, that you can so deftly summarize your life in one experience. There may be others who have different ideas about the value of your life, and your view is just one among the many and perhaps, when all is said and done, not even the most accurate. In any case your life is not over; so who knows how your epitaph will read. In the poem there appear to be several views of the first speaker. Charles, thanks for the reply; it is valuable in that you show how poetry, even an unexpected poem, is able to accomodate many voices in few words. You are right to point out that different understandings of a person's life are possible and what one thinks is the primary value of one's own life isn't necessarily the most accurate. Self-examination is continuous and subject to revision.